Some of the great scenery on the Bear Lake Classic course. Photo courtesy Troy Oldham. May 6, 2015 – The Bear Lake Classic is weekend event that includes a hill climb, a road race, a century, a half-century, and a team time trial. It will be held from May 15-17, 2015 in Garden City, Utah. The event will travel many of the same roads as stage 1 of the 2015 Tour of Utah. Troy Oldham, organizer with Headspin Events, tells us about the event. Cycling Utah: Tell us about the event weekend – what are the options for racers and recreational riders? Troy Oldham: We have the Hill Climb on Friday night, followed by an awards presentation at Sipps (as well as some good snacks), followed by a rider dinner at a special price at Cafe Sabor in Garden City. Cycling Utah: This is the 12th year of the Bear Lake Classic, why do you think the race/ride has lasted so long? Troy Oldham: It is an early-season race with a very fast century and half-century because the route is pretty flat and there is very little traffic or corners that you need to navigate. Our riders range from serious racer and climbers to recreational riders, and it is a great way to start off the cycling season in northern, Utah and Southern Idaho. CU: Headspin Events has stepped in as organizers this year, what does that mean for the Bear Lake Classic? TO: The Bear Lake Classic's legacy is the Logan Race Club and its members, along with the incredible support of the Utah Cycling Association. Our #1 goal is to ensure the event is tailored to the race community, and this year we are making some small safety changes to improve the race experience. Kevin Rohwer and R2R has generously agreed to stay on this year to ensure the race is a success. Likewise, we believe the event provides a unique environment for both a highly controlled road race, as well as a recreational century, half-century and relay option. CU: What changes are you making to the event this year? TO: One thing that has helped our other event grow, the Cache Gran Fondo, is our focus on making the rider experience special, and so we try to keep the rider as the central focus in all we do. The Friday Night Hill Climb will be slightly longer this year, partially to pre-create the same summit climb as the 1st Stage of the Tour of Utah. We are also extending it to take advantage of the overlook parking lot at the top so we can have a safe finish line and also a fun celebration, some snacks and the awards ceremony at the summit. Afterwards Cafe Sabor in Garden City will set out tables and chairs outside and on their deck and offer a special rider-specific dinner for any riders staying overnight. Great vistas await when riding around Bear Lake. Photo: Cottonsoxphotography.net. TO: We are redesigning our finish line to hopefully eliminate some of the bottleneck and potential crowding issues from the past. We are also staggering our start times so that we can send out our 100-mile racers early, and then delay the start of the recreational riders until after the first lap of racers come through. We think the result will be a less congested course, a later (warmer) start for our recreational riders, and an opportunity for more riders to be on the course at the same time. For the recreational riders, the thrill of seeing the racers ride through just before the leave, should be an additional motivator for their own ride. CU: If people want to stay overnight before or after the race, what are the best options? Is there camping nearby? 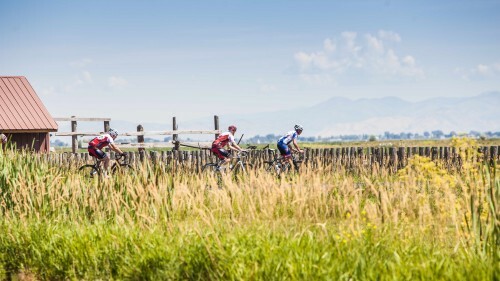 CU: Why should someone register to race or ride in the Bear Lake Classic? 1. Great course with very few turns or corners. 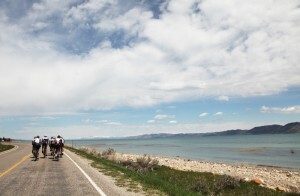 Flat and rolling route around beautiful Bear Lake. 2. Very little traffic or congestion. The event is held prior to the tourist season and so the riders have the place to themselves. 3. Special opportunity to ride 55 miles of the 1st stage of the Tour of Utah. Ride the course, and climb the hill to the summit. The Tour of Utah team and the Logan LOC will be there to support the event and answer any questions. 4. This is the right distance and elevation to start of your riding and racing season. 5. Great price, only $45 for pre-registration. 6. Cash and merchandise prizes. Over $2700 in cash and prizes.